Ages ago one of my first posts was about making monsters. Well, that interest is still going strong 3 years later. This time they did pretty much all of the work. 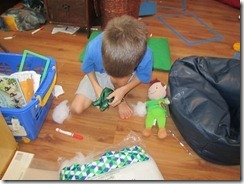 Cutting, stuffing, sewing, and all of that. All we have left is to sew the final seam shut. I had intended to have them hand sew it, but they REALLY want to use the machine. I mean really really. 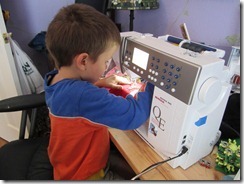 And that particular interest has lasted almost since I first got the machine when they were 2 years old. See the blue tape on my machine? 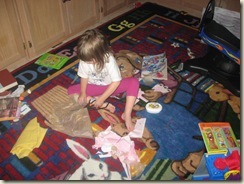 That’s because at 2 they figured out you can stuff pins in there. When I took my machine in for its first tune-up they found 20 something pins in there. YEAH………. I think it took them less than 2 minutes. Then they did the patented scatter and run technique. 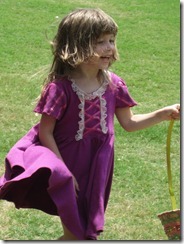 You’ve probably seen Princess in her Rapunzel dress before on my blog. We have to trick her into taking it off and letting us wash it. Jeff and I had been discussing how I should make her another one soon. 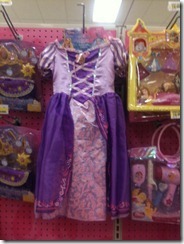 And then Jeff took Princess out for breakfast and went with her to Target where Princess begged and begged and begged to get this dress. Now, I look at it, and I see a repeat of the Sleeping Beauty dress, that within 30 minutes of being worn started unraveling and wasn’t worn more than that first day. I also see a dress that won’t stand up to being worn nonstop for 2 weeks straight. So, I went to Joann’s and got some more fabric, and then took A LOT of pictures to show how I did this. 1. Buy this pattern. Then purchase 3 different fabrics: a lighter purple for the bodice, a darker purple for the overskirt, and a print for the underskirt. Also purchase two different types of ribbon (broader one for sleeves, thinner one for the lacing). 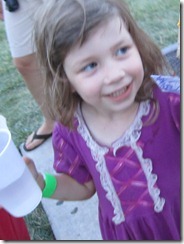 For my 4 year old daughter I bought 1/2 yard of the light purple, 1.5 yards of the dark purple, and 1 yard of the print. I had enough to start making a second. Unless otherwise specified seams are ironed open. 1. 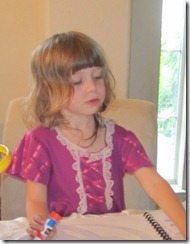 Fold the short sleeve pattern in half. Pull it out from the fold about an inch and cut it out. This ensures the sleeve will have some gather to it. 2. Put the front bodice pattern piece on the selvage edges. Cut it out with about 1 inch of the pattern piece hanging off the edges. 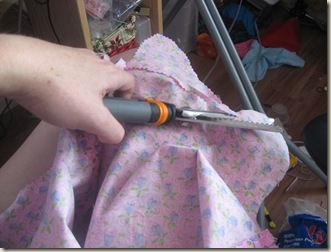 Alternatively cut it out not using the selvages, but instead fold the pattern piece under and cut it that way. 3. Cut out the insert piece on the fold. 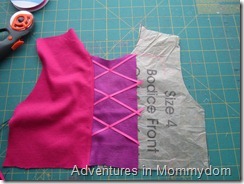 Make sure it overlaps the other bodice piece by about 1/2” to give yourself a bit of wiggle room. 4. Unfold your sleeves. Spray them with 505 spray to make them sticky and start laying the ribbon on top of them. To ensure the sleeves are even I put the sleeves in mirror image and put the ribbon across both of them. This ensures the ribbons are put the same on both sets of sleeves. If you don’t have 505 spray you can just pin it like mad, but this lets me not pin. I’m lazy that way. 5. 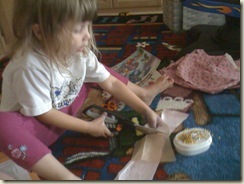 Now sew the ribbon down. Depending on the width of your ribbon you could just zig zag it, my ribbon was just wide enough I had to sew down one side and up the other. 6. Spray the bodice insert with 505 spray. 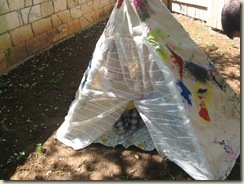 Than lay out the ribbon on it in a criss cross pattern. I used the grid pattern on my cutting board to make sure the X’s were always the same size. Mine are 2 inch X’s, but I think a 1.5” X might look better. 7. Tack the ribbon down in the middle with a couple of stitches, backstitching several times to make sure it is very secure. 8. Iron under the seam of the bodice front about 1/4 inch. This doesn’t have to be exact. 9. Lay the bodice insert on top of the front bodice pattern piece and line up the neckline (I’m showing the second half because it is more obvious in the picture what you’re doing). 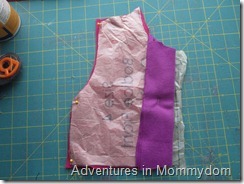 Than carefully place the bodice front you’ve ironed on top so it matches the pattern piece and pin it. 10. 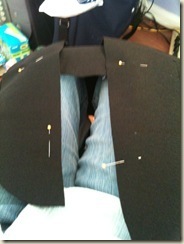 Now, topstitch the front bodice pieces together. 11. 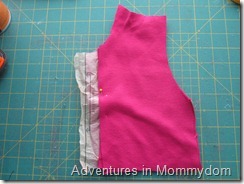 Sew the shoulder seams together just like it says in the instructions. 12. Run a gather stitch along the shoulder seam of the sleeve. For my machine I set the stitch length to 5, and just ran it through very fast. 13. Gather the sleeve to match the armhole. I find it easier to put the sleeve in flat for projects like this. 14. 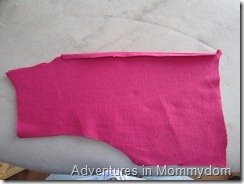 Sew the sleeve in (don’t forget to reset your stitch length or switch it to your knit fabric setting). 15. Iron the seam towards the sleeve. This helps give it a bit more support, and I think feels better when wearing it. 16. Sew together the panels for the front of the underskirt. Run a gather stitch on the top of the skirt. 17. 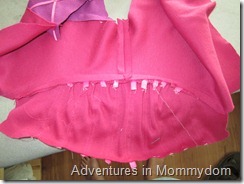 Hem the sides of the two front overskirt panels using a double needle. Run a gather stitch on the top. 19. 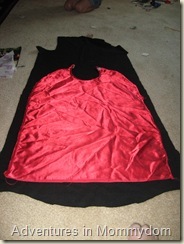 Find the middle of the bodice front and place a pin there. 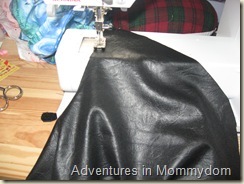 Then find the middle of the underskirt pin that to the middle of the bodice front. Now start gathering it up so you like how it looks and pin the heck out of that skirt. 20. Run it through your sewing machine. Iron the seams down towards the skirt. 21. 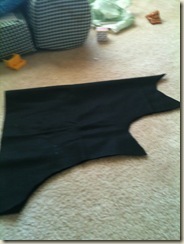 Sew back overskirt panels together. Run a gather stitch, and gather it to the back bodice. 22. 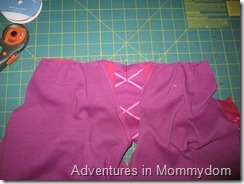 Sew your side seam. I did not catch the underskirt fabric in the seam to cut down on bulk, but that’s personal taste. 23. Iron down your hems. 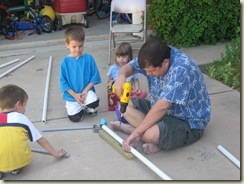 I tended to use a 3/8” hem, but that’s an eyeball measurement. 24. Sew down using a double needle, this makes a nice straight hem, but still gives it some stretch and give. Hopefully that’s as clear as mud. 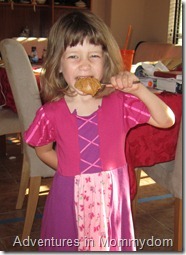 If I base success on her refusing to take it off for 4 days straight, than I’d say it’s a very successful dress. 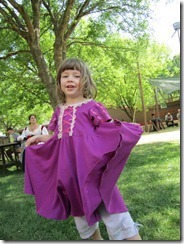 I personally think the bodice shades clash a hair, but she picked it out and won’t take it off, so that’s a success. I’d love to find some stretch lace so I can add the lace. I think that would make it absolutely adorable. 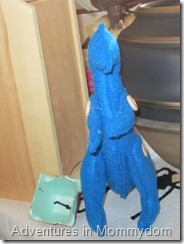 I’ve been making Buddy from Dinosaur Train. Okay, so Buddy isn’t blue, but Superman likes blue and he likes Buddy. So, this is Buddy. They’ve been mostly inseparable since I finished him last week. You can’t see, but his eyes are french knots using 6 strands, and the whole thing (other than the buttons holding the arms on) was done on the machine because I’m lazy and it’s faster. Besides do you have any idea how hard it is to get any serious sewing done when a six year old is showing up every 2 minutes demanding how far you’ve gotten on his Buddy? Pattern is found here. I love this pattern. It’s like an hour project or less probably. This is one of our new favorites in the house. Do you know about these cheater panels? If not let me enlighten you. The top is pre-shirred, and the bottom is pre-hemmed. 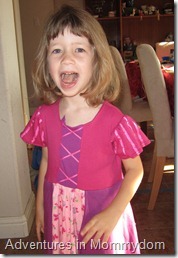 Just have it cut to your darling daughter’s measurements plus an inch, sew one seam, and you’re done. Or, you could be like me and add some shoulder straps because I just know what would happen if my four year old wore a strapless dress. Goodbye dress. Seriously, that girl has problems with her clothes. 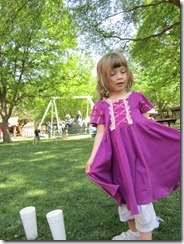 And, here’s Princess in her new Rapunzel dress! I’m thinking about adding in elastic on the bottom of the sleeves. It fits great, except since I didn’t use stretch lace I had to cut the neckline hem in a couple of places to get it over her head. Oops. And sadly there’s no picture of me in my new outfit I sewed, before I got a picture I bought a pretty new dress that Jeff loves. 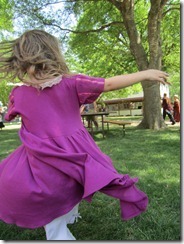 I’ll be getting those pictures up soon from the Ren Fest in general. So……… Batman had been going to be Iron Man. 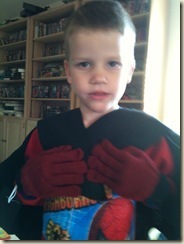 This is the best picture I have of his Iron Man costume, unless you want one in shadows. He loves it. 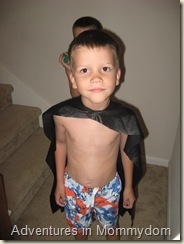 And then after watching the stupid, I mean lovely Diego Halloween episode he wanted to be a bat. 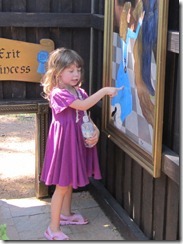 And Princess wanted to be a bird. 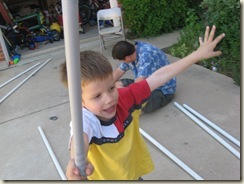 Both of which necessitated making new costumes. So, here’s the quick and dirty how to, mostly taken on my phone because yet again I’ve put my camera somewhere “special.” I wish my camera had a homing device on it I could activate like my phone does. I’d lose it a lot less. 1. 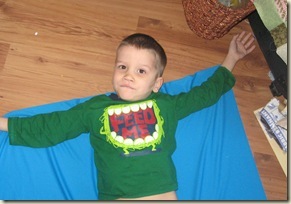 Have your child lay down on the fabric with one layer of it open. Mark where their wrists hit it, and about where you want the wings to end. (and for those who are wondering this picture is actually from the Blue Arrow costume). 2. 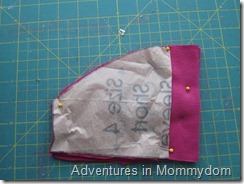 Now fold you fabric in half, and using your “measurements” cut out a bat shape. My scissors are ridiculously dull, and I should buy new ones because I’m atrocious to scissors, so I cut one layer at a time. 3. 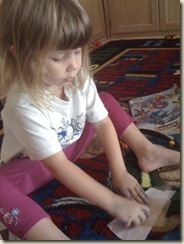 Cut 2 strips of 1/4” elastic the length of your child’s wrists and sew that onto the ends of each arm. 4. 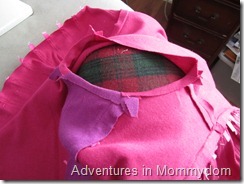 Then use some of the scraps you cut off to make the collar. I laid it over Batman and had him model it to find the right fit. 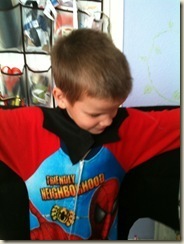 (Luckily he was wearing the fleece pajamas he found in my winter clothes box, so all fabric stuck to each other). 5. Pin your “straps” to the back. Also pin where you’re going to sew on the velcro. Note to self: stop buying the sticky back velcro, it doesn’t stick very well, and it gums up my needle. 6. Trim the straps to look like bat wings as well. 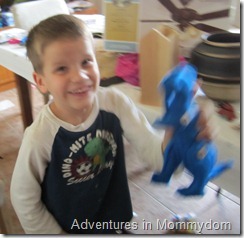 Try to get your very wiggly child to stay still for this. 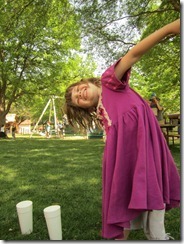 Try very hard to get your kids to stand still to take pictures. In case you’re wondering they don’t really cooperate. For Princess’ bird costume, I used the same approach, but cut it to look like feathers, and still need to make her collar/straps. 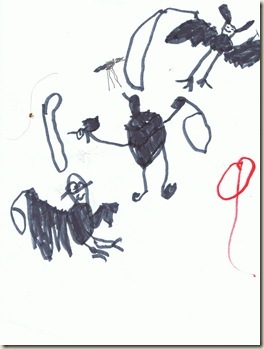 Oh, and this is Batman’s illustration of what his costume is supposed to look like. I just had to include my “instructions” he gave me. I think one of those is supposed to be the bat toy I’m making as well. 1. 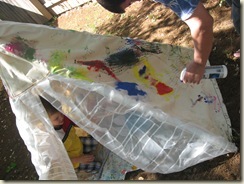 Take a piece of fabric about 1.5-2.5 feet wide and about 3 feet long. 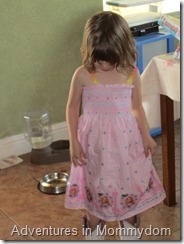 Take a large dinner plate and trace around the corners to round the corners. 2. Take a small desert plate, in the middle of your fabric (to determine the middle, fold the fabric in half and mark that spot). Put it partially off the edge, and then trace around this. 3. Now cut on those lines you’ve just traced. It should end up looking roughly like the red cape up above. alternative 1. 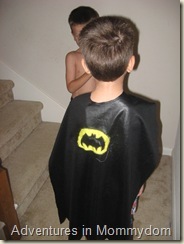 Take another cape you have and trace around it. 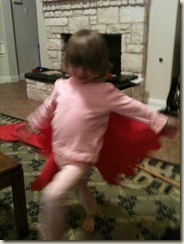 Let’s face it little kids collect capes like crazy, or mine do. 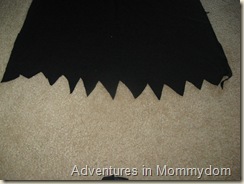 optional step: if making a Batman cape, cut triangles out of the bottom to get the cool zig zag look on the bottom of his cape. 4. cut out a piece of velcro about an inch long and round the corners (this keeps the velcro from snagging as much). 5. 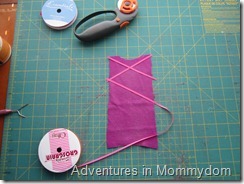 Put one side of the velcro on top of your fabric and sew around it, then sew down the neckline to the other piece which will be on the bottom of the fabric. Then sew around this velrco piece. Sewing down the neckline keeps it from stretching and running. 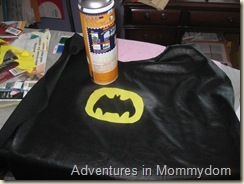 I had that problem with some capes I didn’t reinforce and that was quite nasty to deal with. 6. Find a piece of yellow fabric, ideally a knit, but if not you can zig-zag around it. Cut out a bat shape. You can freehand like I did, or find a Batman logo you like the looks of, print it out, and use that for your general idea. 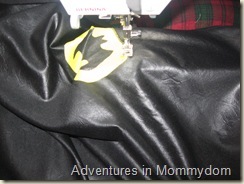 hint: to free form it, but still have it be symmetrical, fold the yellow fabric in half and cut out half of a bat. 7. Zig zag around the edges of the symbol (if your fabric is a knit or felt you can just sew a straight stitch). My fabric was woven, so it needed the zig zag to keep from fraying while being used. 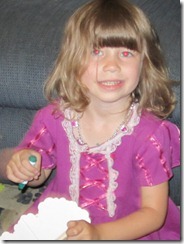 Have your child happily model the birthday present for a friend, before heading off to a birthday swim party. 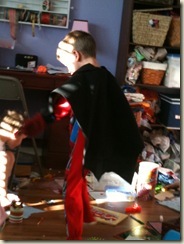 And for those who are wondering, yes Batman is modeling the Batman cape. I only have about 10 of these at my house, so I’m well practiced in the art of sewing capes, but a friend was wondering about the details. From start to finish the project is about 1 hour, more like 30 minutes. 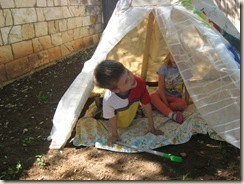 Come back tomorrow to see what the kids did while I made this. 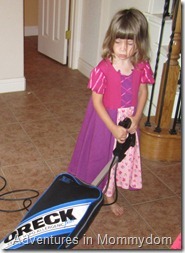 I thought of titling this post like Mother, like Daughter……. 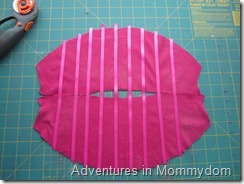 The super easiest way to trim curves and seams. So, when you’re sewing you are supposed to clip your curves of your seams. In theory you clip little triangle wedges out of the curves that are supposed to curve in (think crotch, collars), and clip slits in curves that go out (think princess seams) to make them lie smooth. Here’s what I do once I’m sure I won’t need to rip the seam out. 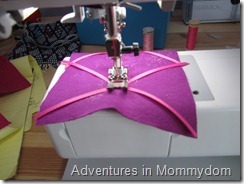 I get my pinking shears and just trim the seam with those, so much faster than cutting those little triangles, and it has the added benefit of finishing the seam at the same time. Princess seams I still tend to do the slits, because I’m often lining those and don’t care about if the seam is finished. 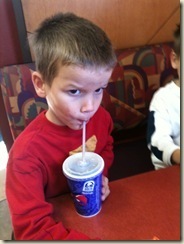 For more great quick tips head over to We Are That Family and Works for Me Wednesday. Ages and ages ago I teased the people reading with this post and this one. 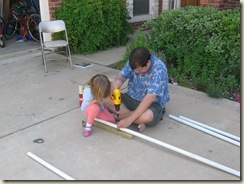 I got all of the sewing done and then the project languished for a very long time as I sat there and didn’t ask Jeff at any of the right times to help me with drilling the pipes. But finally, six months, okay really nine months later it’s done. 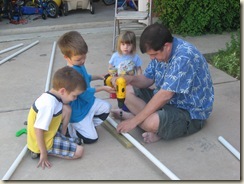 The kids all got to take turns drilling a hole. This was of course super exciting, working with real live power tools. 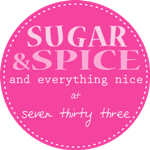 And then……. drum roll please…… We set it up. Pause for dramatic unveil. Now I just need to thread some good heavy duty, but small rope, through the holes so it quite sliding down. 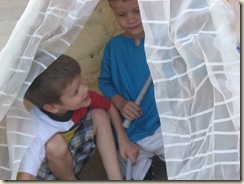 The kids happily and very quickly threw us out of their fort. I feel so unloved….. Maybe I should go to the garden and eat worms. But, that’d be gross, so I don’t think I will. 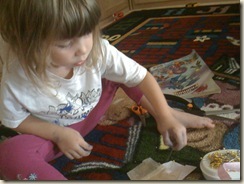 And, I don’t want to sew one of those again, it was no fun. 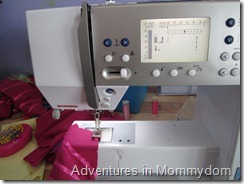 Too much yardage to lug around my machine.